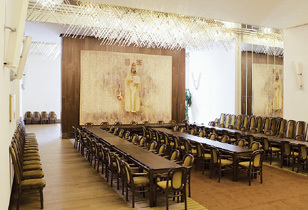 Visits to the meetings of most committees of the Chamber of Deputies are public, i.e. members of the public can visit them at any time. The committee may resolve, however, that its meeting (or its part) shall be closed to the public, but this happens quite rarely. Meetings of the Mandate and Immunity Committee and the Steering Committee are closed to the public according to law. You can find the date and time and the agenda of the various committee meetings on the webpages of the committees. When entering the buildings of the Chamber of Deputies, it is necessary to present a valid ID card or passport at the reception desk (depending on the venue of the committee's meeting; information is specified in the invitation to the meeting). Reception desks are located at Sněmovní 4, Sněmovní 3, Sněmovní 1 or Malostranské nám. 19/7). You can find detailed information regarding the meetings of individual committees at the Information Centre of the Chamber of Deputies.